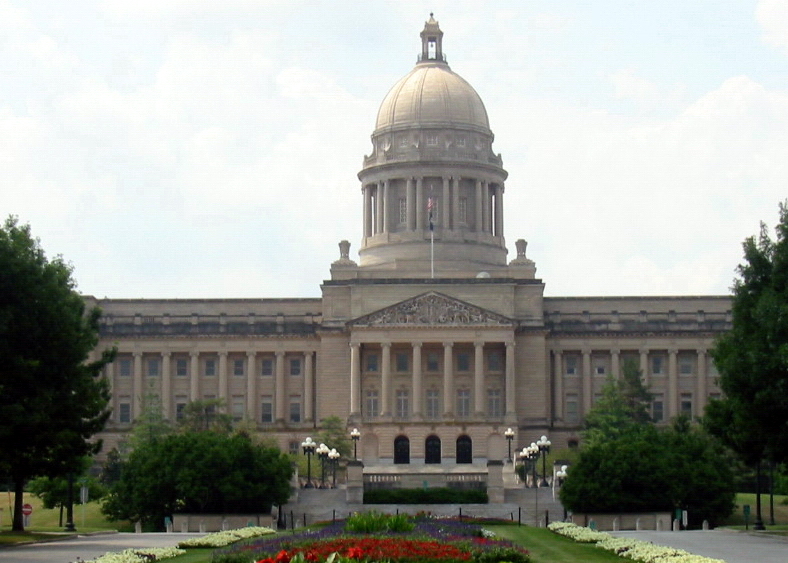 Frankfort is the capital city of the Commonwealth of Kentucky and the seat of Franklin County. Based on population, it is the fifth-smallest state capital in the United States. It is a home rule-class city in Kentucky; the population was 25,527 at the 2010 census. 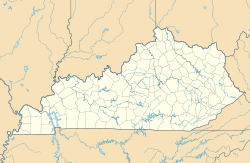 Located along the Kentucky River, Frankfort is the principal city of the Frankfort, Kentucky Micropolitan Statistical Area, which includes all of Franklin and Anderson counties. The town of Frankfort likely received its name from an event that took place in the 1780s. American Indians attacked a group of early European-American pioneers from Bryan Station, who were making salt at a ford in the Kentucky River. Pioneer Stephen Frank was killed, and the settlers thereafter called the crossing "Frank's Ford." This name was later elided to Frankfort. In 1786, James Wilkinson purchased the 260-acre (1.05 km2) tract of land on the north side of the Kentucky River, which developed as downtown Frankfort. He was an early promoter of Frankfort as the state capital. Bird's eye view of the city of Frankfort in 1871. Downtown Frankfort is seen in the foreground, while South Frankfort lies across the river in the background. Fort Hill is in the lower left hand corner. After Kentucky became the 15th state in early 1792, five commissioners from various counties were appointed on June 20 to choose a location for the capital. They were John Allen and John Edwards (both from Bourbon County), Henry Lee (from Mason), Thomas Kennedy (from Madison), and Robert Todd (from Fayette). A number of communities competed for this honor, but Frankfort won. According to early histories, the offer of Andrew Holmes' log house as capitol for seven years, a number of town lots, £50 worth of locks and hinges, 10 boxes of glass, 1,500 pounds of nails, and $3,000 in gold helped the decision go to Frankfort. John Brown, a Virginia lawyer and statesman, built a home now called Liberty Hall in Frankfort in 1796. Before Kentucky's statehood, he represented Virginia in the Continental Congress (1777−78) and the U.S. Congress (1789−91). While in Congress, he introduced the bill granting statehood to Kentucky. After statehood, he was elected by the state legislature as one of the state's U.S. Senators. In 1796, the Kentucky General Assembly appropriated funds to provide a house to accommodate the governor; it was completed two years later. The Old Governor's Mansion is claimed to be the oldest official executive residence still in use in the United States. In 1829, Gideon Shryock designed the Old Capitol, Kentucky's third, in Greek Revival style. It served Kentucky as its capitol from 1830 to 1910. The separate settlement known as South Frankfort was annexed by the city in January 3, 1850. Downtown Frankfort, with the Capital Plaza Office Tower at center. During the American Civil War, the Union Army built fortifications overlooking Frankfort on what is now called Fort Hill. The Confederate Army also occupied Frankfort for a short time starting from September 3, 1862. On February 3, 1900 Governor-elect William Goebel was assassinated in Frankfort while walking to the capitol on the way to his inauguration. Former Secretary of State Caleb Powers was later found guilty of a conspiracy to murder Goebel. Frankfort has grown considerably since the 1960s. A modern addition to the State Office Building was completed in 1967. The original building was completed in the 1930s on the location of the former Kentucky State Penitentiary. Some of the stone from the old prison was used for the walls surrounding the office building. Capitol Plaza was established in the 1960s. It comprises the Capitol Plaza Office Tower, the tallest building in the city, the Capitol Plaza Hotel (formerly the Holiday Inn, Frankfort), and the Fountain Place Shoppes. The Capital Plaza Office Tower opened in 1968 and has become a visual landmark for the center of the city. In August 2008, capital officials announced a plan to demolish the Tower and redevelop the area over a period of years. They intend to replace the outdated Tower with a smaller, four- or five-story building in order to create a more pedestrian-oriented scale at the complex, to encourage street activity. Frankfort is home to several major distilleries of Kentucky Bourbon, including the Buffalo Trace Distillery (formerly Ancient Age). Church of the Ascension Episcopal Church, organized in 1835, is located at 311 Washington Street. Good Shepherd Roman Catholic Church was built in 1850, following the immigration in the 1840s of many Irish and German Catholics to the city. The old Parish is located at 310 Wapping Street. First Baptist Church, also known as "First Baptist Church, Clinton Street", was organized in 1833 and is the largest African-American congregation in the city. The church has hosted religious, civil and political leaders, including Dr. Martin Luther King, Jr. It is located at 100 Clinton Street. Hilltop view of modern-day Frankfort. The Kentucky River is visible on the left. Frankfort is located at 38°12′N 84°52′W﻿ / ﻿38.2, -84.867 (38.197, -84.863). It is in the (inner) Bluegrass region of Central Kentucky. The city is bisected by the Kentucky River, which makes an s-turn as it passes through the center of town. The river valley widens at this point, which creates four distinct parts of town. The valley within the city limits contains Downtown and South Frankfort districts, which lie opposite one another on the river. A small neighborhood with its own distinct identity, Bellepoint, is located on the west bank of the river to the north of Benson Creek, opposite the river from the "downtown" district. The suburban areas on either side of the valley are respectively referred to as the "West Side" and "East Side" (or "West Frankfort" and "East Frankfort"). According to the United States Census Bureau, the city has a total area of 14.6 square miles (37.8 km2), of which 14.3 square miles (37.0 km2) is land and 0.3 square miles (0.78 km2) is water. Frankfort does not have a commercial airport and travelers fly into Blue Grass Airport in Lexington, Cincinnati/Northern Kentucky International Airport near Covington or Louisville International Airport in Louisville. Capital City Airport serves general aviation. Frankfort has a Humid Subtropical climate with four distinct seasons. Winter is generally cool with some snowfall. Spring and fall are both mild and relatively warm, with ample precipitation and thunderstorm activity. Summers are oppressively hot and humid. As of the 2010 Census, there were 25,527 people, 11,140 households, and 6,053 families residing in the city. The population density was 1,746.3 per square mile (674.3 /km2). There were 12,938 housing units at an average density of 885.1 per square mile (341.7 /km2). The racial makeup of the city was 77.1% White or European American (75.6% non-Hispanic), 16.5% Black or African American, 0.3% Native American, 1.4% Asian, 0.02% Pacific Islander, 1,8% from other races, and 2.9% from two or more races. Hispanics or Latinos of any race were 1.48% of the population. There were 11,140 households out of which 27.9% had children under the age of 18 living with them, 32,6% were married couples living together, 16.7% had a female householder with no husband present, 5.1% had a male householder with no wife present, and 45.7% were non-families. 38.3% of all households were made up of individuals and 12.2% had someone living alone who was 65 years of age or older. The average household size was 2.14 and the average family size was 2.83. The age distribution was 20.8% under 18, 13.1% from 18 to 24, 26.6% from 25 to 44, 25.5% from 45 to 64, and 14.0% who were 65 or older. The median age was 36.7 years. For every 100 females there were 92.9 males. For every 100 females age 18 and over, there were 89.4 males. The median income for a household in the city was $40,009, and the median income for a family was $43,949. Full-time male workers had a median income of $37,445 versus $34,613 for females. The per capita income was $22,299. About 19.8% of families and 22.4% of the population were below the poverty line, including 38.7% of those under age 18 and 7.5% of those age 65 or over. Frankfort is the focal point of a micropolitan statistical area consisting of Frankfort and Franklin County as well as adjacent Lawrenceburg and Anderson County. The city is also classified in a combined statistical area with Lexington and Richmond to the east. Frankfort's municipal population makes it the fourth smallest capital city in the United States. Commonwealth Gardens is a 501(c)3 organization dedicated to the formation of community gardens and school gardens in the Frankfort and Franklin County area. It advocates the consumption of locally grown food because it tastes better, takes less energy to get to the dinner table, and it supports local farmers and merchants. Walk/Bike Frankfort is dedicated to making the capital of Kentucky the best city in the Commonwealth for pedestrians and cyclists. Frankfort Climate Action Network works to raise awareness about the threat of climate change and solutions for it. The Folkbike Re-Cyclery is a non-profit, volunteer organization located at 425 Lewis Street in Frankfort. They restore and repair used bicycles, providing them to people who cannot afford new ones. Many residents donate unused bikes to the group. East Frankfort Park Disc Golf Course is home to an 18-hole Disc Golf Course, which has been described as short, but technical. The local disc golf club has begun promoting the sport in the area. This is the home of the March Mad Disc and Capitol City Clash tournaments. Frankfort, Franklin County and the surrounding area also have a considerable homeschooling population. San Pedro de Macorís, Dominican Republic. William Wirt Adams (1819−88), brigadier general in Confederate Army. Thomas Carlin, seventh Governor of Illinois. Will Chase, actor and singer best known for Broadway musicals and ABC series Nashville. Elijah Craig, Baptist preacher and early bourbon distiller, moved to Frankfort from Virginia in the 1780s. Tim Farmer, outdoorsman and television presenter; host of Kentucky Afield. John Marshall Harlan, U.S. Supreme Court justice. Grover Land (1884−1958), Major League Baseball catcher. Paul Sawyier (1865−1917), Kentucky Impressionist artist. Landon Addison Thomas (1799−1889), state legislator. George Graham Vest (1830−1904), U.S. Senator from Missouri, best known for popularizing the notion that a dog is a man's best friend. George C. Wolfe (1954−), Broadway producer, playwright, and film director. ^ a b "City History". Official website. City of Frankfort, Kentucky. http://www.frankfort.ky.gov/About/About-Frankfort/City-History/city-history.html. ^ Rennick, Robert M. (1993) Kentucky's Bluegrass: A Survey of the Post Offices, pp. 91 & 99. Lake Grove, Oregon: The Depot, ISBN 0-943645-31-X. ^ Commonwealth of Kentucky. Office of the Secretary of State. Land Office. "Frankfort, Kentucky". Accessed 25 Jul 2013. ^ Wheatley, Kevin (August 1, 2012). "Plans for Old Good Shepherd Church Fall Through". State Journal. http://www.state-journal.com/local%20news/2012/08/01/plans-for-old-good-shepherd-church-fall-through. ^ "Church History". First Baptist Church. http://www.firstbaptistfrankfort.com/church-history.html. Retrieved March 2014. ^ "Station Name: KY Frankfort Downtown". National Oceanic and Atmospheric Administration. ftp://ftp.ncdc.noaa.gov/pub/data/normals/1981-2010/products/station/USC00153028.normals.txt. Retrieved May 18, 2013. ^ "General Climate Summary tables". Southeast Regional Climate Center. http://www.sercc.com/cgi-bin/sercc/cliMAIN.pl?ky3028. Retrieved May 18, 2013. ^ "CommonWealthGardens - The Garden of News All Over the World - CommonWealthGardens - The Garden of News All Over the World". http://commonwealthgardens.com. ^ "Walk/Bike Frankfort". Sites.google.com. http://sites.google.com/site/walkbikefrankfort. Retrieved 2011-12-11. ^ "Josephine Sculpture Park". Josephine Sculpture Park. http://josephinesculpturepark.org. ^ "The Folkbike Re-Cyclery - Join The Revolution - Frankfort, KY". folkbikerecyclery.org. http://folkbikerecyclery.org. ^ "Lawrenceburg Disc Golf Association - Lawrenceburg (KY) Disc Golf Association". Lawrenceburg Disc Golf Association. http://ldga.weebly.com. ^ "East Frankfort Park Disc Golf Course". Professional Disc Golf Association. http://www.pdga.com/course_directory/course/east-frankfort-park-dgc. ^ Who Was Who in America, Historical Volume, 1607−1896. Chicago: Marquis Who's Who. 1963. ^ "Illinois Governor Thomas Carlin". National Governors Association. http://www.nga.org/cms/home/governors/past-governors-bios/page_illinois/col2-content/main-content-list/title_carlin_thomas.html. Retrieved Sep 2013. ^ "George Graham Vest: Tribute to the Dog". The History Place. http://www.historyplace.com/speeches/vest.htm. Retrieved November 2013. Wikivoyage has a travel guide for Frankfort, Kentucky. "Frankfort". The American Cyclopædia. 1879. This page uses content from the English language Wikipedia. The original content was at Frankfort, Kentucky. The list of authors can be seen in the page history. As with this Familypedia wiki, the content of Wikipedia is available under the Creative Commons License.